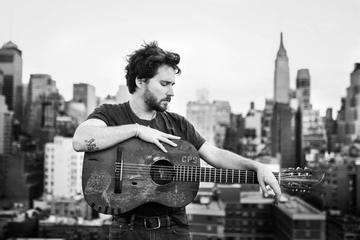 Christopher Paul Stelling is a songwriter, whose work primarily draws upon influences from the American folk tradition. Noted for his passionate vocal delivery and dexterous finger-picking, he thrives in live performance. His debut album Songs of Praise and Scorn was released in 2012, followed quickly by his second effort, False Cities, in 2013. Christopher has toured extensively across the United States and Europe, logging many hundred of shows. His third album, Labor Against Waste, is anticipated in early 2015. Stelling started singing at a young age in various school and church events. At 12 he began playing guitar, and though some lessons were had in the back room of a used instrument store that also sold kitchen appliances, he is primarily self-taught. Stelling always found traditional schooling torturous, and quickly dropped out half way through his first semester of college to work in a used bookstore… it was here that he furthered his interest in poetry and literature, and began writing songs. In 2004 he left home and began a series of wanderings through Florida, Colorado, Washington, Massachusetts, and the Carolinas, before the fates led him to New York City in 2008. After settling in Brooklyn, Stelling began performing regularly under his own name and released numerous demos before his first official release in 2012. Since then he has lived primarily on the road.